I love this place so much! I went in yesterday with baylage which I had neglected for months and came out with an amazing full head of ashy blonde and cool brown highlights which Vicki made look so easy. Vicki is amazing at what she does and she's such a lovely person to talk to. She makes it such a great experience which is so important when you're there for a couple of hours! The salon is beautiful, clean and modern and they have iPads on each station to order your drinks. Not only will you come out with amazing hair but you can also have hot chocolate with cream and marshmallows! The seat at the wash stations also give you an amazing massage whilst you're being washed off in a relaxing setting. The staff are really passionate about what they do and Aaron is brilliant if on the very rare occasion you're not 100% happy. I cannot praise this salon enough; just look at the countless pictures to see how amazing they are. AR salon is by fair the best salon I've ever been, five star!! Although I've been coming to AR for quite sometime and always experienced a good service, today exceed my expectations. It is clear and lot of time, effort and thought has gone into the salons new design by Aaron's himself. Aaron's managed to created a warm and relaxing environment for both staff and clients. Today for the first time I had Kayleigh colour and cut my hair, and if I'm honest I'm not the easiest of clients as I'm quite nervous and particular about how I want it. Kayleigh immediately made me feel at ease she was very knowledgeable and professional. I absolutely love my hair, both colour and cut are perfect, she is an extremely talent lady. I personally would like to thank both Kayleigh and Aaron, because for the first time in a long time I feel happy and confident again, thank you so much . Can't wait for my next visit. After a few unsuccessful colour attempts at other salons, I was resigned to thinking that my hair would always end up bright orange/yellow. I booked my appointment at Aaron Russell after having a cheap stripey balayage at another salon. During my consultation, Freya filled me with confidence that she could fix my hair and achieve what I was hoping for. My whole experience was luxurious from start to finish and Freya completely transformed my hair, I have honestly never felt so happy leaving a salon! All of the staff were friendly and attentive making sure you had a drink and a slice of cake to go with. I'd be very reluctant to go anywhere else for my hair colour after seeing what can be done here! I CANNOT FAULT THIS SALON! i've been 4 times, both before and after the second salon was made and had Sam (at handcross currently) and Megan (at crawley currently) do my hair - every time has been an incredible experience and i always feel amazing afterwards! The team really know what they're doing and they're so realistic with what they can achieve when doing a consultation yet always exceed my expectations. This is the only salon where i've walked out loving what my hair looks like! I am 100% sure i've found a salon and a hairdresser I can completely trust. 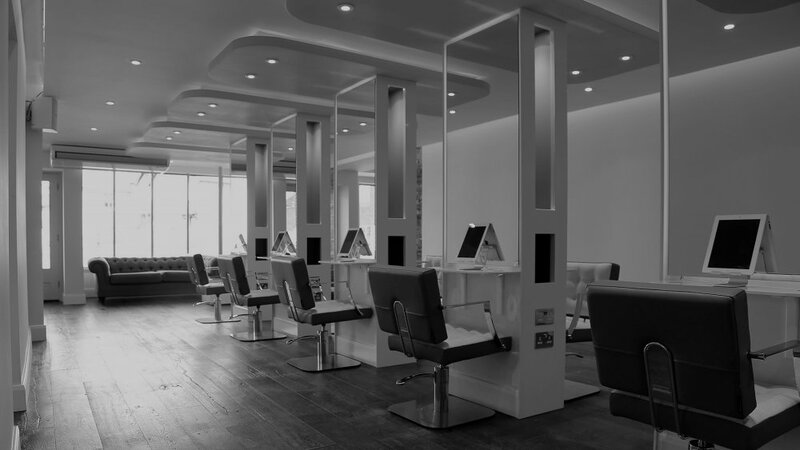 Please, if you're considering getting your hair done here - book your appointment straight away, you won't regret it! Amazing morning @ Aaron Russell. My two girls had their hair cut and were kept occupied by the on hand I-pads and comfy sofas, while I had a couple of green teas, a back massage from the wash hair chairs in what felt like a spa room, an amazing treatment on my hair and Vicky delighted me by turning my brassy, non-vibrant hair into a ash blonde, turning heads, hair do!! Thanks so much to Vicky and Harry - we will be back!! Had the best experience at the salon! From the consultation to the end result, everyone was so friendly and professional and I couldn't have been happier with the end result. I had a full head of foils and the Olaplex treatment, transforming my hair from dark brown to blonde, exactly the outcome I wanted. They go above and beyond to make sure you're getting the right treatment and that you're comfortable throughout. Would recommend to everyone, no matter how challenging you think your hair goals are, they will achieve them! Paris was especially lovely and friendly, she really knew what she was doing and walked me through every step of the way. this salon is the only one I've been too with pictures and my hair comes out exactly like what I have shown and also if they can't do it then they tell you the truth or advise how much and how long it would take to get that result they don't lie and charge loads of money for something you don't want I'm so glad I found you guys!!! After noticing Aaron Russell on social media and following the page on Facebook and Instagram - I knew I would be in safe hands when I finally plucked up the courage to try a new hairdressers. I walked into the Pound Hill salon on the off chance I could speak to someone about what I'd like to have done to my hair. Harry was on reception, he was very welcoming and helpful and handed me over to Lianna. I sat down with Lianna for over 30 mins, I explained how I wanted to have my hair and voiced my concerns. Lianna was excellent, I felt so reassured that she understood the look I was going for and how she was willing to spend the time to talk to me about it, I felt very valued. I booked in with Lianna the following weekend... eager beaver I know. I've honestly never been happier with the result of my hair. From start to finish it was a pleasure being in the salon chair. I recommend Aaron Russell and especially Lianna to anyone! Paris has done my hair for a while now and yet again she has surpassed my expectations! 18 months ago I booked a consultation with her after seeing her work. I had harsh, practically black box dye hair and years of build up of various colours. I dreamed of being blonde again and did not think it would happen without severely damaging my hair. Yesterday I went in for my latest appointment and I am still totally speechless with how it has turned out. Beautiful blend of colours including blonde! I have already had several comments on it. I would recommend her and the salon to anyone. I trust her so much she would never recommend something unless it was necessary or that wouldn't suit you. Thank you Paris I am one VERY happy customer as always. Had a balayage, cut and blow dry today with Lauren and I am so happy with the results. My hair is so thick and was very dark and Lauren was so patient and did a fantastic job of lifting it. Such amazing blend for her first client! Will definitely come back and ask for Lauren she will be an asset to the Aaron Russell team! I came into the salon today for a balayage, cut and blow dry with Lianna, I am so happy with the result! Lianna was so lovely and very confident, and I cannot recommend her enough. I will definitely be visiting again soon. Thank you!